I found the 'stairstep applique' pattern in my copy of Bruce Grant's 'Encyclopedia of Rawhide and Leather Braiding'. 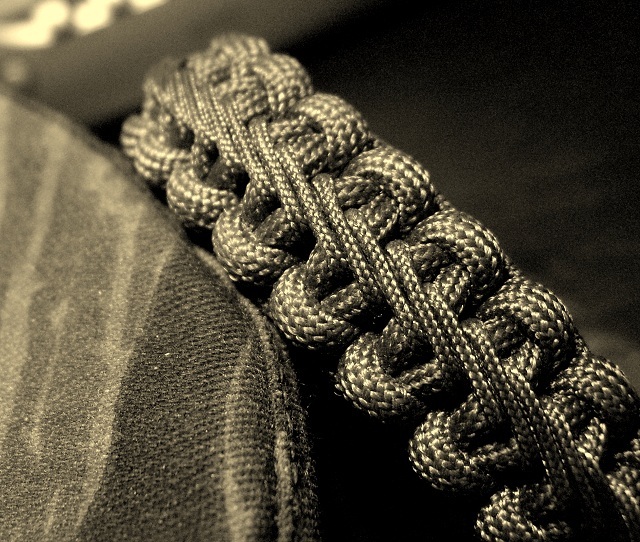 I added the stitching to an already tied Solomon bar/cobra stitch/Portuguese sinnet paracord bracelet with a 1/2" side release buckle, using about 4 feet or so of 1.4mm cord with a small Perma Lok lacing needle. The book's diagrams show a single leather thong being worked through a series of holes in a piece of leather, that could be used to join multiple sections being sewed together, as edging, or added as decorative work. The pattern is fairly simple with the strand coming from the top end of the bracelet at a slight right to left angle, down over three horizontal strands, back up under two to the right of the previous strand, and repeat. The start and end of the stairstep stitching cord was secured under a few knots of the underside of the bracelet. 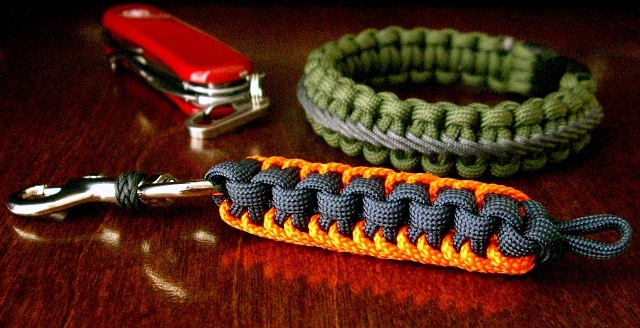 The stitching could easily be varied with how many strands you work over/under and what type of paracord bracelet design it would be added to. I also tied a navy blue paracord lanyard with orange 3/32" Tether Cord, stairstep stitched down one side and up the other, with one piece of cord. Shown attached to a Wenger Evo S13 Swiss Army Knife with a medium Flat Titanium Gate Clip. 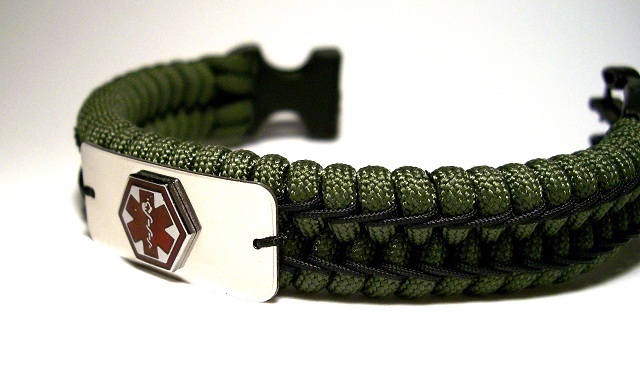 And another woven paracord bracelet, with medic alert tag, and two parallel lines of stairstep stitching along the length, done with black 0.9mm cord. @Joseph, I've not done a video for this, but as described in the blog post, it is fairly simple. Simple - but really, really nice. I like it. The orange on navy blue looks awesome from the side (last pic). The stitching add a lot to the bracelet and lanyard. I would have never thought about the lacing. I think I'll try one. Thank a lot for sharing this. I really like that. You know, the bracelets I made using your video are smaller, tighter and nicer than any I've seen for sale commercially. Not really related to this particular post but have you ever done a post on using various knot techniques to create a dog lead (complete with snap hook and a way to extend it if needed)? Also, really love your work. @Jon, It's been a while since I've tied a paracord dog lead/leash, and even longer since I posted any to my blog, going as far back as August '06 I think. A search in Google images alone brings up thousands of examples of paracord dog leads/leashes, but I don't believe there are many adjustable versions out there. Do you do the thin cord as you tie the solomon bar, or do you do the solomon first and then add the thin cord? @Troberg, I add the thinner diameter cord to an already tied bracelet/lanyard. A really neat alternative application from a leather braiding technique. looks great. Hello Stormdrane, first let me say thanks for the awesome works/inspiration. started tying recently and cant seem to stop. joined KHWW( wardog1911). and follow your blog/you tube etc. I have noticed a variance in cord quality ( 550 specifically)from multiple sources wanted to know where you get yours(550 full size)if you don't mind. I have found good micro and nylon locally. Thanks again. The Supply Captain has been a reliable online source for 550 paracord, and I had ordered from them back when they sold just through ebay(emmado22), before opening their website. I've recommended them for years and have no affiliation with them other than being a customer. Mainly what I want is a bracelet with a black bar (on a different color bracelet). And also like this weaving a lot. @Anonymous, I don't have any specific tutorial for tying that type of bracelet with the different colored band, but all that's being done is having a separate 'band' color added in with the core strands of the 'primary' color. With the section you want the 'band' to be, you switch primary working end with band core strands for that section, then back again to finish the rest of the bracelet. It could be done with one working end type bracelet or two working ends. Do you tie the Solomon less tight to give more room for the 0.9 to go through or do you tighten as normal, then lace? @Jake, That depends on how tight you tie the ones you make. 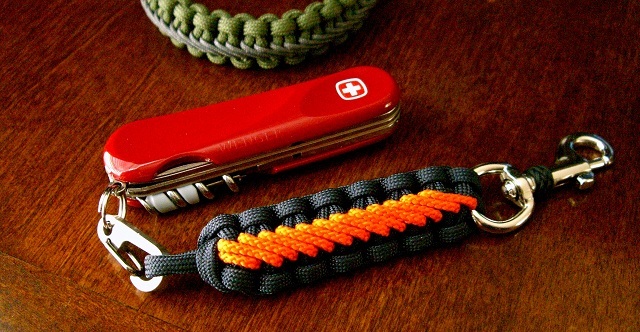 I had no problem adding 1.4mm and 0.9mm cord to paracord bracelets that I had tied several years ago, but using larger diameter cord, like 1/16" or 3/32" required a looser tied base knot, like the lanyard I tied with stitching added to both sides. Nice work Stormdrane! What type and where do you get the .9mm and 1.4mm cord used for stitching? These are pretty cool. I used to have one way back in the day. The armed forces love to make these surprisingly. They also though have all the five fifty cord anyone could ever want and a lot of waiting to do. Cool stuff. @Chris, It's been a while since I bought any cord from Hobby Lobby. It's hard to tell about cord just by looking at it online, so I couldn't say for sure about whether or not any certain type would work, but if it's a small enough diameter, it probably would work for stitching. 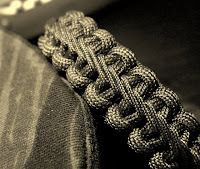 @Anonymous, I have not done a tutorial for adding stairstep stitching to a paracord bracelet, but if you look at the previous blog post with the center stitching and video tutorial, the process is just slightly different. Very nice and would go over well the VA Hospital. Where are you getting the .9 and 1.4mm cord for the center stitching? I have done quite a few paracord bracelets (you can see a few examples here). In my case I find it really hard to get cord like that! 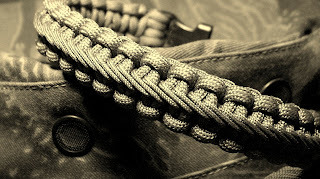 I have not tried this kind of stitching, but I have done lacing, with the use of 550 cord. But for center stitching, you really need micro cord. I wonder if any stores hold thinner nylon cord.